Cycling Canada is pleased to announce the details for its second annual Canadian Cycling Hall of Fame Weekend, to be hosted in Milton, Ontario, on October 1st and 2nd. Festivities will kick-off on Saturday, October 1st, with the official unveiling of plaques to commemorate the 2016 induction class. The unveiling ceremony will be open to the public and will take place in the Canadian Cycling Hall of Fame at the Mattamy National Cycling Centre (Community Entrance) at 6:30pm, just prior to the start of the Saturday evening session of racing at the Milton International Challenge. The events continue on October 2nd, with the Lexus "Ride with Legends" and Canadian Cycling Hall of Fame induction luncheon, both to be hosted at Crosswinds Golf and Country Club in Burlington, ON. Hall of Fame members/inductees: Steve Bauer, Curt Harnett, Gordon Singleton, Gord Fraser, Alex Stieda and Brian Walton. Members of Canada's 2016 Olympic track cycling team: Kirsti Lay, Hugo Barrette, Kate O'Brien. Participants will be able to choose one of two ride routes (50km and 70km). All riders will receive an official Canadian National Team jersey and will be treated to a buffet breakfast at the golf club before the ride. The 2nd annual Canadian Cycling Hall of Fame induction luncheon will be held following the ride from 1pm to 3pm. The ceremonies will honour the 2016 class of Hall of Fame inductees, which includes Gord Fraser, Louise Lalonde, Marie-Helene Premont, Alex Stieda, Brian Walton and Canada's 1908 Men's Team Pursuit squad. 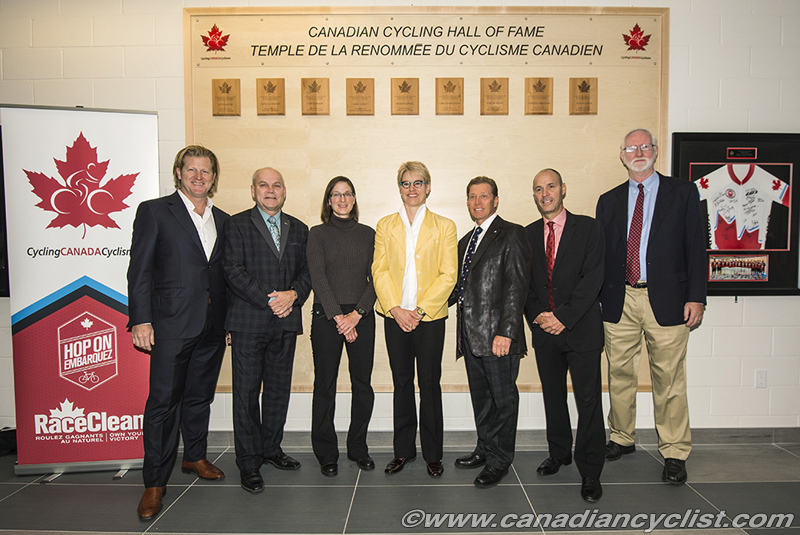 The Canadian Cycling Hall of Fame, which has its permanent home at the Mattamy National Cycling Centre, was inaugurated in 2015. The inaugural class of inductees included Steve Bauer, Tanya Dubnicoff, Curt Harnett, Marc Lemay, Jocelyn Lovell, Lori-Ann Muenzer, Torchy Peden, Gordon Singleton and Alison Sydor. For more information and to purchase tickets please visit cyclingcanada.ca.